Lily and William have a week off in October for fall break. Mom and I decided we'd take the kids to San Diego for the week to enjoy the beach and the gorgeous weather. Once our trip was booked, Ryan and Dad quickly cleared their schedule for a few days to join...shortly followed by Mallory and Casey. Our family likes to travel together and never wants to be left out of a fun vacation! We had the kids to ourselves for the first half of the week and just bummed around town. 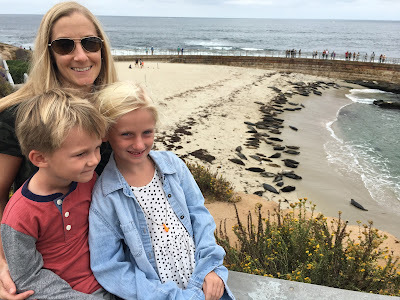 Lots of time at the beach, a quick trip to La Jolla to see the seals, and exploring our home base of Del Mar (scoping out and trying all the restaurants is Nanny and I's favorite thing to do!). But the real fun started for Lily and William once the boys arrived. Beach baseball, Papa hopping and chasing the waves, evening sunsets playing in the water (after baths!! ), and all the fun that comes with a week at the beach. 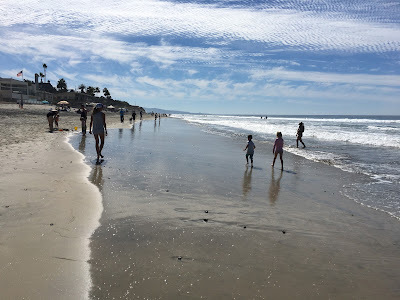 We loved Del Mar and can't wait to go back!